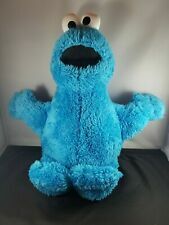 sesame street cookie monster plush khols cares. Condition is Used. Shipped with USPS First Class Package. 1980 Sesame Street Live! Program. All your favorite characters in bright and colorful illustrations. Condition is Used, there are pages with crayon and pencil marks, see photos for best description. Vintage Sesame street Beach Towel Bert and Ernie Kids Youth . Condition is excellent! See pics for details. Sweet 14” Applause Elmo plush hand puppet...Gently used with a small spot on top of one eyeball...Please examine the photos and if you have questions, please ask. We will be glad to answer. If you require more information or more pictures,make the request. Sesame Street Ernie Ceramic Wall Plaque, 1994. Condition is Used. Measures 5.5x5. Elmo Ukulele Limited Edition. Condition is Used. Shipped with Flat Rate Freight. Sesame Street Bert & Ernie Sing-Along LP (1975) CTW-22068. Condition is Used. Shipped with USPS First Class Package. Requires Two ( 2) AA batteries. Not included. Pre-owned, without Box. In Good Condition. Has scuff marks on the trash can. ( see photos ). Benny Rabbit - 2. Sherlock Hemlock - 2. The fabric is crisp and has a small hem at bottom and a cafe rod opening at top. These could easily be taken out and just used as fabric. 1 Big Bird in a nest. 2 Oscar the grouch in trashcans. 1 Bert in a gift box. I've got quite a bit of miniatures, so make sure you take a good look around. I consider all of you friends and will give top service. All product is new (unless otherwise stated on the page). A Muppets production. Cookie Monster Fork By DEMAND. Condition is Used. Shipped with USPS First Class Package. Please see photos. Vintage Sesame Street Childs Dish Set Plate Cup Bowl . Condition is Used. Shipped with USPS Priority Mail. Sesame Street Figure Big Bird Hasbro 2010 Sesame Workshop. Condition is Used. Shipped with USPS Priority Mail. The figure is in good shape. Slight wear on his left foot but in good collectible shape. Look at the pictures carefully. Sesame Street 3 Vintage Puzzles Whitman 1979&1984. Condition is Used. Shipped with USPS Parcel Select Ground. I do my best to note anything of significance. I am usually not the original owner, so I usually don't know most item's history. Condition is Used. I will only use pictures of the ACTUAL product that you will receive. After 48 hours the order will be canceled unless there has been communication made. Sesame Street Muppets Fabric Panel 100% Cotton , Sesame Street, Big Bird . Condition is New, 35X45.Shipped with USPS First Class Package. Original label and first pressing. Lp cover has small split on one edge and excellent on the other two edges. This lp is overall very good plus condition. El mo a nd Cookie Monster. S ee photos for more details. Ma de b y Fi sh er P ri ce. Da te d 20 07. Recorded in 1970 this is the first recording for the hit TV show. This lp may have slight surface marks but have no effect on the playing. Has been played and tested. This lp is in very good plus conditiion. Vintage 1972 Muppets Inc. Oscar The Grouch Cookie Jar (Ceramic). Vintage 1972 Muppets Inc. Oscar The Grouch Cookie Jar (Ceramic).. Superb mint condition. No marks no scratches no chips. Classic item. Unique rare find in such condition. Reliable on time shipping. Heavy but will cut price on shipping. Perfect for the avid fan or collector. Suitable for framing. Oscar the Grouch Cookie Jar. There is a chip on his mouth. There is also wear on his head. (see pictures) Still a cute piece! Missing are the bag of letters and chalk. Lp has been played and tested. Great Lp and in Very Good Plus condition overall. Excellent cover is very clean. LOT OF (3) COLORING BOOKS. FROM: GOLDEN. The penny is for size and is not included. A small stain on the left foot and the left hand. This item is washable but I will let you choose how you lift stain. Never used, never opened! From 1990s! Super low price! Lot Of 4 Sesame Street Mini Beanies Kelloggs Elmo Ernie Bert Rubber Duckie New! Lot Of 4 Sesame Street Mini Beanies Kelloggs Elmo Ernie Bert Rubber Duckie New!. Original tags but no bags. Condition is New. Shipped with USPS First Class Package. Cookie Monster as Artist Pvc Figure Refrigerator Magnet vintage. Cookie Monster Pvc Figure Refrigerator Magnet vintage.. Condition is Used. Shipped with USPS First Class Package. Approx. 3 3/4" tall. Recorded on WB label serial no. Great sounding lp and great for the kids. Booklet is complete but unattached from the lp. Booklet is in excellent condition and may be glued back on the cover. This lp is very good plus overall. There is marker on the bottom of the feet. There are a few marks on the back of his leg. There is dust in crevices. 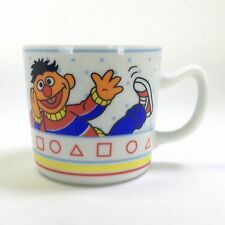 Bert Ernie Sesame Street Porcelain Ceramic Childs Kid Cup Mug 2 3/4"
Sesame Street Lot of 8 Collectibles Vintage Ceramic Christmas Ornament Complete! Sesame Street Skating Friends Abby Cadabby and Rosita Playskool Hasbro 18 mo +..
Sesame Street Oscar the Grouch bumper sticker wall decor vinyl decal, 5"x4"